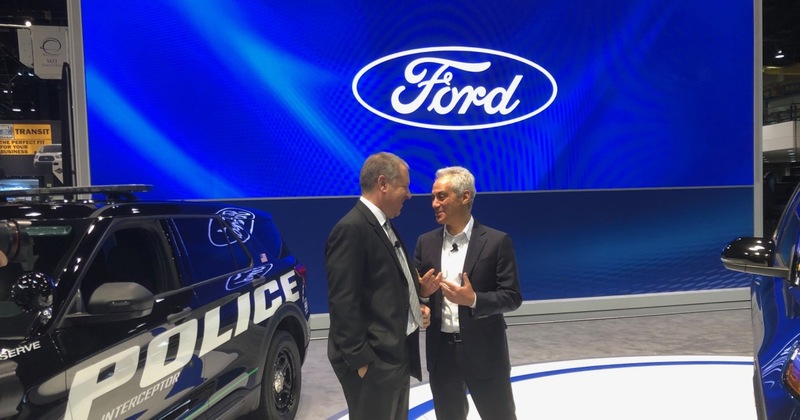 Ford said Thursday it will hire 500 workers and invest $1 billion in its Chicago assembly operations to help keep up with booming demand for sport and crossover-utility vehicles. The announcement comes on the heels of cross-town rival GM axing 4,000 workers, and is part of the $11 billion restructuring Ford announced last fall that includes dropping all passenger car models except the iconic Mustang. It is shifting resources to light trucks, like those it is building in the Windy City. The Chicago Assembly and Stamping Plants currently build both the full-size Taurus sedan and Explorer SUV. The Taurus will be dropped as part of Ford’s move out of passenger cars, but the Explorer is enjoying a level of growth it hasn’t experienced in decades. The investment plan will allow Ford to expand capacity for the Explorer as well as the new Explorer Police Interceptor it is launching. Ford has traditionally dominated the market for police vehicles and expects the Interceptor — which debuted last month at the Detroit Auto Show — to expand its hold. Also scheduled to go into the Chicago Assembly Plant is the all-new Lincoln Aviator, a big, three-row sedan that is winning early praise and could become a critical part of Ford’s drive to revive the long-struggling luxury brand. The $1 billion investment will be used to add “advanced manufacturing technologies,” according to company sources, and also to train workers to both boost plant efficiency and improve quality. Not all the money will go into machine technology, however, with Ford planning to devote $40 million of the investment to make the plants “better places to work” by improving lighting, bathroom and cafeterias. It will also upgrade security in plant parking lots. Ford is by no means the only automaker rushing to expand light truck production. Last month, Fiat Chrysler Automobiles Chief Executive Officer Michael Manley confirmed that the automaker will add a new plant to build two upcoming Jeep models. That will mean new hiring, he said, without providing numbers. But, based on typical assembly plant staffing levels, that could run to 3,000 jobs or more. FCA has already moved almost entirely out of passenger car production, maintaining only three large models at a plant in Ontario. General Motors is making a similar shift, with six passenger car lines going away this year, models as diverse as the Chevrolet Cruze and Cadillac CT-6. In the process, however, it has “unallocated” three plants, which is expected to result in their closure by year-end. That has generated a firestorm of controversy, especially as one of the company’s most promising new models, the Chevrolet Blazer SUV, is being built in Mexico. GM this week began handing out pink slips to about 4,000 hourly workers as part of a broad restructuring. Thousands of others have already taken voluntary packages, while contractors have also been terminated. The $6 billion project is eventually expected to reduce GM’s workforce by around 14,000, though President Mark Reuss this week told NBC News that with many factory workers opting to retire, only about 100 jobs will be lost on the plant side. Other blue-collar workers are being offered the opportunity to move to existing plants, including the Flint factory that this week launched the new Chevrolet Silverado HD pickup. It is expanding capacity by 25 percent with the new model. Industry analysts expect to see more changes as automakers move to adapt to the SUV boom and other changes, and Ford could announce job cuts of its own in the U.S. over the next few months as part of its own restructuring.